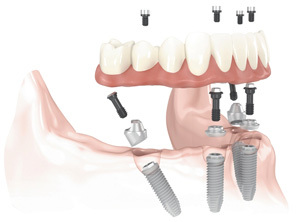 We are excited to offer a newer, modern, evidence-based approach to full mouth rehabilitation. This treatment gives patients a fixed solution that is more cost effective, more time efficient and highly esthetic as you will get your beautiful smile the same day as surgery. This concept is popularly know as Teeth in a Day, All-On-4, or the Graftless Solution. In essence, if you have some remaining teeth that are not very strong or missing your teeth and currently wear removable dentures, you are a candidate for this procedure. It is a simplified approach where grafting is not necessary as the 4 implants are placed strategically to avoid your sinuses and nerves. We then proceed to convert a prosthesis to fit over the implants and is fixed so you do not need to take it out. You walk into the office and walk out the same day with a completely different mouth – a new set of teeth and smile that cannot fall out or be removed by you. See some results from our patients here. Please inquire about this Teeth in a Day or All-On-4 procedure today if you feel this could benefit you, it truly is a life changing experience! You can eat and smile again like you’ve never had before.